"Not many pages into this gloriously moving book, a feeling begins to grow that it would have been a humbling yet exquisite experience to have sat and talked with Biagio John Bonina. What his daughter, Mary Bonina, has given us is a solid and lasting portrait of a man who was simple and complicated. (That is not a contradiction once you come to know him)...America is a country of grand men and women who live on a modest scale, and no one fits that category more than he does. Once his eyes began to fail him, he lived even more for his family and its welfare and his efforts and work make him, in my mind, the kind of real hero we fail to glorify anymore. So enter this book and come to know her father and his dedicated and overwhelmingly loyal daughter, as well as a large stage of family members and friends who are unforgettable and insanely knowable and human." "Mary Bonina casts her considerable spell with exquisite sentences and unerring, evocative details. She is a writer of inordinate compassion, formidable intelligence, and unflinching honesty. My Father's Eyes documents a family's coming to grips with the legacy of blindness, a daughter's unflagging allegiance to her father, and one man's heroic determination to live a life of independence and quiet dignity despite obstacles that would crush the strongest of us. The book is an inspiration. When I finished reading it, I walked around for days seeing the world through its lens. Yes, it's that good. It's that important." "Packard. Record player. Telephone party line. Fallout shelter. Holy Ghost. These and other blasts from the past make up the world of this beautiful, clear-eyed memoir that reads like a novel. It's partly the story of a girl who loved words on her way to becoming a writer. Of all the words in her universe, the most important were eyes and seeing for this was a girl growing up with a beloved father going blind. Becoming his guide and his eyes, she becomes herself. And what a character he is! We come to know him as if we're all his children, one minute consumed with terror at the dangers he faces, and the next minute awed by his courage, and the next exasperated by his human flaws. And ultimately, we see and feel for ourselves what his daughter means when she says, 'I know about love from being my father's eyes.'" 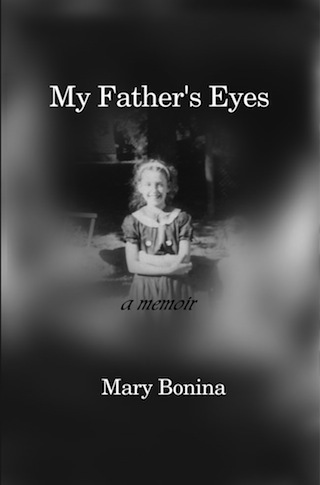 "Mary Bonina's Clear Eye Teacelebrates the everyday events in our lives: a father returning from work; family members grown frail; a girl weeping on the train. And yet in her hands, the daily has a miraculous tinge. The sharp vision she was praised for as a child, when she was called 'the one with good eyes' who could spot the 'tiny spider floating/in the cup of wine' has developed into a kind of x-ray that illunminates the secrets, the motivations, and the bare bones inside our common gestures. I closed this book with a feeling of more than happiness, something very close to joy, and I can think of no greater praise." "Here is poetry that does what the title of this book suggests: it gives us a careful steeping in the real, and shows us also how hard it is to stay in emotional touch with it. Here is childhood, for example, seen as if one has finally found a way to open a door on what it was really like. Here also is mortal dread and loss, each embraced without flinching, and here too is praise for gentleness and love, neither any less real than the suffering they are interwoven with. Here then is the 'clear eye tea' of Mary Bonina's poetry." "Mary Bonina's poems, written with a strong, authentic voice and a compass-eyed gaze, balance between presence and absence:dirty plastic pretend ivory thing ('Shop of Small Pleasures'); You will hear, too, the dove/its awful sad cry, because/in the rainforest even the sadness/of a dove has more msucle. ('Sorcery'), and between whole and fractured lives: What on earth were they doing with the gun?/They were friends and it was an accident ('Shrine in Cambridge'). Line by line these poems breathe, and it is in this breath the reader's imagination shares the gifts of revelation, reconciliation, and ultimately, grace." "These are poems concerned with the primary relationships of our lives -- family, friends, lovers, nature -- and in them, there is always the larger world rattling around. This volume of narratives, lyrics, dialogues, and found poems demonstrates Bonina's accomplishment and range. Here is an assured voice imbued with musicality, surprising us in the simple way it offers up deeper meaning, often using imagery drawn from the everyday." "Mary Bonina’s Living Proof is a hefty 45 pages and worth every drop of ink Cervena Barva Press shelled out to bring it into the world. Each poem reads like a miniature story, stabbing at the heart of memory and nostalgia, capturing lifetimes in a single moment or turn of phrase..."
"...the voice of these poems knows death, luck, the mall, the hard edges of place, New England places, the violence of the world. It runs very concretely and in many poems, past what its bearer sees as if standing still in deep attention. It is written so that "he who runs may read" but turns entirely inside out the terms and assumptions of that old insult. What a place this human world would be if we all ran at Mary Bonina's speed, what Flannery O'Connor once called the terrible speed of mercy."